A hot bowl of soup is always pleasing. When you have been advised to boost your iron levels so as to increase your RBC count and you are bored to use greens and sprouts suggested by your dietitian to make rotis and salads, turn to this section. A variety and eye catching green soups like Lettuce and Cauliflower Soup, Spinach and Baby Corn Soup, Fresh Asparagus soup cannot fail to please your palate. Beans and Sprouts have also been effectively used to conjure up recipes like Garlicky Moong Sprouts with Spinach and Rajma Soup. 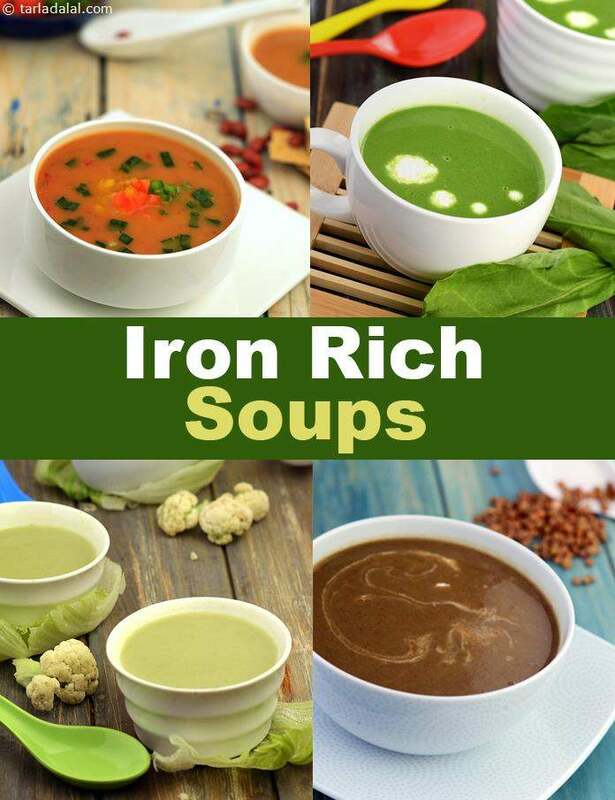 Not only iron, but these soups are a great way to pump in some other nutrients like protein, vitamin A, folic acid etc. They are sure to kindle your appetite as much as you sip in. Tarla Dalal Thank you so much for your kind words.